Recently, there has been a dramatic increase in the number of auto break-ins in the East Bay. Many of these break-ins are being committed by professional thieves who specialize in stealing catalytic converters and gasoline. Catalytic converters contain a small amount of platinum. In 2001, platinum was selling for $500 an ounce. Today, platinum is selling for over $2,000 an ounce, and the price of gasoline has more than tripled since 2001. You can make your car much less attractive to thieves by doing a few simple things. When you park your car, make sure there is NOTHING of value - or even of interest - visible inside your car. There are foolish and desperate criminals who will break into a car for a handful of nickels and pennies that can been seen in a car's ash tray. Put all bags and boxes out of sight in your trunk or glove compartment, even empty boxes. A tenant of mine once said to me: "Somebody broke into my car. He stole an empty I-Pod box on the back seat and nothing else. Why would anybody do that?" I said: "Well, this criminal had no way of knowing that the I-Pod box was empty until he broke your window and snatched it." Get a real or a fake car burglar alarm. A fake burglar alarm is just a flashing red light on your dashboard that is wired to the ignition, so it goes on when you turn off the engine and goes off when you turn on the engine. A fake burglar alarm is very effective in chasing away would-be thieves and costs $50 to $100 installed. Any store that sells and installs real auto burglar alarms can install a fake one. Get a locking fuel tank cap. They sell for around $20. and are available at most auto supply stores. I have been asking that question for many, many years; and I have never gotten a good answer. I see a lot of smart political commentators on TV debating questions like: "What issues are most important to the Values Voters?" In 2007, a number of major presidential candidates, including John McCain, attended and spoke at the "Values Voters Summit" in Washington, D.C. 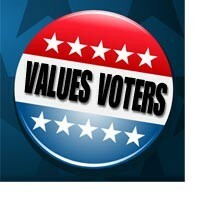 I recently spoke to someone on the staff of the Family Research Council, one of the sponsors of the "Values Voters Summit", and asked: "How do you define the term 'Values Voters'?" She answered: "We get asked that question a lot. I can't give you a definition, but everyone knows what it means." Well, I'm part of 'everyone,' and I don't know what it means! Now let's think about it - people don't get paid for voting, and voting isn't compulsory in the U.S., so isn't everyone voting for their values? What else do people vote for? What else could people be voting for? I can't figure out why otherwise intelligent people debate questions like: "What will the Values Voters do in November?" Everyone is a Values Voter! We just don't all have the same values. I also feel that the term "Values Voters" is arrogant and insulting because the name implies that anyone who disagrees with the agenda of the Values Voters coalition lacks values. This has got to be one of the stupidest political issues - ever! As you can tell, this has been frustrating me for a long time. WHY DO PEOPLE GO TO DISNEY WORLD IN SUMMER? This is another question that has puzzled me for a long time. Most people here in the San Francisco Bay Area don't realize how awful the weather is in Orlando in Summer. It is oppressively muggy. The average daily high temperature in Orlando in July and August is 92 degrees. The average daily AM relative humidity is over 90%. When you walk out of your hotel, you feel like you are stepping into a sauna. I grew up in Baltimore and know that feeling well. The problem is that Disney World was built over a tropical swamp. They kicked out the alligators and drained the swamp; however, even the Disney Corporation couldn't change the climate. Making things even worse, Summer is also the peak of the thunderstorm season in Orlando. On average, there are 17 days of rain per month in July and August, so it rains on more than half of the days in the month, and an outdoor theme park isn't much fun when its raining. On top of that, Summer is also the peak of Florida's hurricane, tornado, and mosquito seasons. Now - you might think that Disney World is less crowded in Summer, but No, the park is jam packed, and the hotels are full, and fully priced. Disney World is expensive, even in Summer. Adult admission is $71 a day. Children's admission is $61, and Disney says that anyone age 10 or older is an adult. (September, 2008 Update. Admission to Disney World is now $80 for adults, $70 for children.) Most of the restaurants in the park and on-site hotels serve pricey Character Meals. A typical Character Meal is the Chef Mickey Buffet. Breakfast is $20 per person. A dinner show, like Mickey's Backyard Barbecue, costs around $60 per person. A family of 4 can easily spend $10,000 to $15,000 on a one week vacation at Disney World without being extravagant. It is a mystery to me why anyone goes to Disney World in Summer. I understand why people on the East Coast go to San Francisco in the Summer, but Orlando? I don't get it. I really don't get it! In 2003, Congress passed the Jobs & Growth Act which included a huge tax break for businessmen purchasing passenger vehicles weighing 6,000 pounds or more, commonly known as the "Hummer Tax Break." This law allowed business owners to write off the entire cost of these enormous vehicles in the year of purchase. In 2004, my CPA told me that if I bought a fully-loaded Hummer for business purposes (like picking up rent checks), I could get over half of the $100,000 purchase price back - in cash - at the end of the year from the IRS. The law contained no tax break for vehicles weighing under 6,000 pounds. As a result, for a businessman in a high tax bracket, the net after-tax cost of a Hummer or Cadillac Escalade SUV was less than than the cost of a 4-door Chevy Impala. Amazing, isn't it? This tax break has since been repealed. When I tell people about this law, most people think that I am making up this story. It sounds unbelievable! I only buy chocolate 2 or 3 times a year because in order for me to get it wholesale, I have to buy 500 pounds, or more, at a time. I got a shipment in June, and it was 30% more expensive than the same stuff cost a year ago. I was expecting an increase, but not 30%! When I told my sales rep that a price increase this big is hard to absorb, she suggested that I raise my prices by 10%. I told her that wouldn't help, since I give all my chocolate away for free. She thought that over and said: "Well, in that case, maybe you should raise your prices 20%." I wonder what sort of grades she got in math? On July 4, the Turner Classic Movie channel will show 6 of Alfred Hitchcock's best movies, one right after another, all commercial-free. Its a collection of films worth copying. At 4:30AM (Pacific Time), its "Notorious" with Cary Grant, Ingrid Bergman, and Claude Rains. This movie was made in 1946 and foresaw things to come. Nazi war criminals move to Argentina and plan a return to power and another war. That actually happened soon after this film was made. At 6:30AM, its "Shadow of a Doubt" with Joseph Cotton and Teresa Wright. This film was shot on location in Santa Rosa in 1943. At 8:30AM, its "Psycho" with Anthony Perkins, Janet Leigh, and Vera Miles. When "Psycho" came out in 1960, I knew people who would not take showers for a long time after seeing this movie. At 10:30AM, its "Vertigo" with James Stewart and Kim Novak. See what San Francisco looked like in 1958 in another great movie. At 12:45PM, its "The Birds" with Rod Taylor, Tippi Hedren, and Jessica Tandy. Finally, at 3:00PM, its "Rear Window" with James Stewart and Grace Kelly. These are 6 of Hitchcock's best movies, and they are all being shown without interruption. WORST APPLICATION EVER. Could this one be the worst ever? Snowball. One of the strangest applications I ever received was for a one bedroom apartment on McAuley Street in Oakland from a well-dressed, middle-aged woman. She walked through the apartment, filled out an application form and handed it to me. After looking briefly at the application form, I said: "Is your name Snowball?" She answered: "No. Snowball is the name of my cat." I said: "But you wrote 'Snowball' after 'Name of Applicant'." She said: "Yes. I did." I was confused by that, so I read her application form more carefully and discovered that all of the applicant information she provided described her cat, not herself. For example, after "Occupation:" she wrote: "Companionship and catches mice." I said to this woman (who's name I never learned), "I don't understand. Do you want the lease in your cat's name?" She said: "Yes." I said: "Why?" She said: "Well, as I understand the law, if the lease is in my name, then I would be responsible for paying the rent and damages to the apartment." I said: "Yes. That's right." She said: "Well, that's why I want the lease in my cat's name." I nodded my head to indicate that I understood her line of reasoning. I thanked her for her application and told her that I would call her if I decided to rent the apartment - to her cat. Snowball did not get the apartment. Swedish Coffee. I have 18 - 8 ounce vacuum packed bags of "Bryggkaffe Morkrost filter coffee dark roast." I got them as a rebate when I purchased some furniture last month at Ikea. It is good coffee, and its fresh, but like many other coffee drinkers, I have a preferred brand, and this isn't it. I like Jeremiah Pick French roast. Firefox 3. This isn't a gift from me, but this may be the most valuable free thing you get this year - from anybody! You can download Mozilla's new Firefox 3 web browser at: Mozilla at no cost and with no strings attached. It works with Windows PC, Mac, and Linux computers. Firefox 3 is faster than Microsoft Internet Explorer but uses less memory. If you already have Firefox 2 on your computer, migrating to Firefox 3 is automatic. Firefox 3 has several new security features. Both Firefox 2 and Internet Explorer warn you when you log onto known "phishing" web sites. "Phishing" sites are designed to look like the web sites of legitimate financial institutions and businesses. The purpose of these look-alike web sites is to get personal information from you so they can steal your identity. Firefox 3 also warns you when you land on web sites that attempt to infect your computer with viruses, spyware, worms, and other "malware" (malicious software.) A pop-up warning appears on your screen when you come to one of these sites with a: "Get me out of here!" button to take you elsewhere. You can click another button to find out why Firefox has blocked the site in question. I trust Firefox more than Internet Explorer because, unlike Microsoft, Mozilla is a non-profit corporation and so has no financial incentive to aid advertisers.